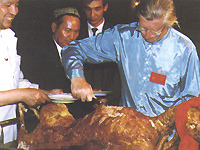 Gansu enjoys a high prestige for its wide variety of snacks, such as Beef Noodles in Plain Soup, 1,000-Layer Beef Cake, Niangpizi (Flour Peel) and Gray Pea Food of Lanzhou, Yellow Noodles and hand-made Saozi Noodles of Dunhuang, Cured Mutton and Fragrant Rice of Zhangye, Shami Bean Jelly of Wuwei and Guagua of Tianshui. The hand-stretched noodles with beef broth are the most popular food in Lanzhou. It requires special skills to stretch noodles. Stretching noodles is just like dancers waving color ribbons. Tasting a bowl of noodles in beef broth in Lanzhou will leave a deep impression on you. Yellow noodles of Dunhuang are as thin as dragon's whiskers and as long and pliable as golden threads. The noodles are delicious and aromatic, mixed with soup or vegetables. 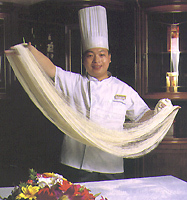 Hand-made Saozi noodles of Dunhuang enjoy a high reputation all over the country. The flour dough is cut into thin slices before being boiled, in addition to delicious seasonings and refreshing soup. The taste is truly unmatched and unforgettable. Created in the Kangxi reign period of the Qing Dynasty, Fragrant Rice is a famous local food of Zhangye, refreshing, tasty and nutritious. Also known as "Guagua Bean Jelly and Flour Peel," Guagua is a famous snack of Tianshui. Legend has it that in the Western Han Dynasty Guagua was imperial food. Between the end of the Ming and the early Qing, Guagua was known as the No. 1 Delicious Food of Qinzhou. Now Tianshui serves Guagua all the year round.